Breguet No. 5 Quarter-repeating, self-winding watch. 1789-94. Sold to Count Journiac Saint-Méard in March 1794. Collection Montres Breguet S.A. © Montres Breguet S.A. Through this retrospective of the works of Abraham-Louis Breguet (1747-1823), visitors to the Louvre will discover the art of watchmaking at its apogee, evidenced by these unique precision timepieces, combining genius, virtuoso techniques and avant-garde aesthetics. Assembled in the exhibition are exceptional loans – watches, clocks and measuring instruments – alongside portraits, archival documents and patents that span Abraham-Louis Breguet’s entire career. Born in Neuchâtel, Switzerland, Breguet completed his apprenticeship and studies in France from 1762 onwards. In 1775, at the age of 28, he married and managed to establish his own business on the Quai de l’Horloge, Paris. Watchmakers of the French capital then competed with Geneva and London in the field of scientific and artistic innovation. Breguet explored and perfected these inventions and complications. But he was not recognized as a Master Watchmaker until 1784. These intervening years saw the gradual development of the automatic (or self-winding) watch and a timepiece with a repeater (or chiming mechanism). The first self-winding watches were purchased by Louis XVI, Marie-Antoinette and several high ranking personalities at the court of Versailles. This led, in 1783, to Breguet receiving a commission for an extraordinary watch incorporating all the innovations and complications known at the time. The end result would be one of the most famous of all Breguet watches, No. 160, also called the “Marie-Antoinette”, which, after several lengthy interruptions, was eventually finished in 1827, i.e. four years after Abraham-Louis Breguet’s death. These watches immediately reveal the originality of his style, characterized by functional simplicity, technical mastery and flawless craftsmanship. 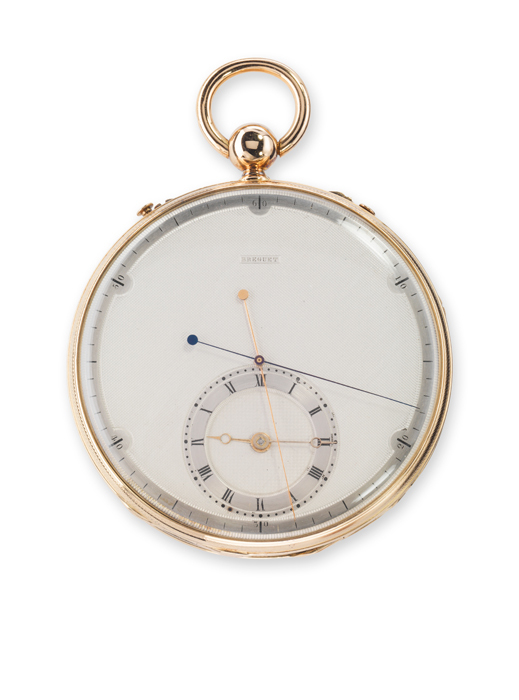 His flat watch cases, easily legible numerals, rectilinear hands and guilloched dials made Breguet watches both unique works of art and discreet, practical, everyday objects, unlike the ornate, ostentatious timepieces made in the last quarter of the 18th century. 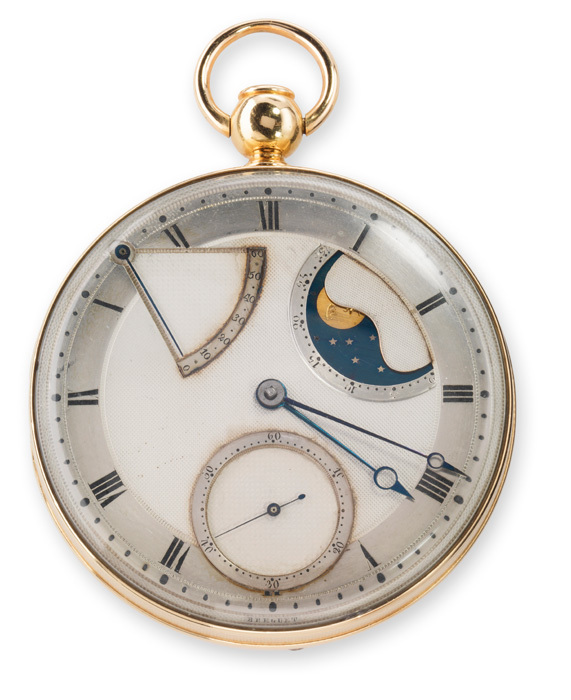 During the Revolutionary period, Breguet made regular trips to England, where he shared the fruit of his research with the watchmaker John Arnold, while enlarging his clientele, which already included the Prince of Wales. In 1793, fearing the consequences of his former relationship with members of the Court and his moderate ideas, Breguet returned to Switzerland. He pursued his research, while striving to run what was left of his Parisian workshops from across the Alps. On his return to Paris in May 1795, Breguet started up business again with new models, notably a simple watch with one hand, known as the “subscription watch” (an advance deposit of a quarter of the price was paid when the order was placed), launched with the aid of an advertising leaflet. This revealed the subtle balance between the researcher and the entrepreneur, who combined constantly updated unique models with functional timepieces. In 1796, Breguet invented a new type of travel clock that went on functioning during transportion. General Bonaparte purchased the first one to take on his Egyptian campaign. Breguet No. 4009 Observation chronometer Forerunner of the modern chronograph. Sold in 1825 to Mr Whaley Collection Montres Breguet S.A. © Montres Breguet S.A. Thus began a thriving period for the House of Breguet, in terms of both sales and inventions, which seemed to spur one another on. Pure research and applied art always fused in Breguet’s work. The first patent he registered for one of his inventions was in 1798 for constant force escapement (the mechanism of the watch is driven by a rigorous constant force). Shown at France’s First Exhibition of Industrial Products (1798), in a travel clock and a metronome, it won Breguet a gold medal. The following year his “tact watch”, which enabled the wearer to tell the time by touching the watch face, was launched on the market. At France’s Third Exhibition (1802), the House of Breguet attracted a military clientele on presenting its “deck watch” and “Longitude watch”, while in 1806, the public were introduced to the “tourbillon regulator” (device that neutralizes the effects of gravity on the workings of watch movements). Although kept in the background by Napoleon I, Breguet received orders from the imperial court and his entourage. Always ahead of its time, the company also exported its timepieces through a network in and outside of Europe, having understood at an early date that its survival depended on becoming international. England, Spain and Russia were its principal foreign markets, but the political situation at the end of the Empire slowed down Breguet’s activity considerably. To compensate for the markets it lost, the company developed its sales in the Ottoman Empire by adapting its models to Turkish tastes. When the Bourbons returned to power, the House of Breguet saw a spectacular turnaround in its activity. Its European clientele reburgeoned and included loyal customers such as Tsar Alexander I of Russia and King George IV of England. Prestigious timepieces once owned by them will be on display in this exhibition. In France, Louis XVIII publicly displayed his respect for Breguet by appointing him Watchmaker to the Royal Navy in 1815 and awarding him a seat in the Academy of Sciences in 1816. At the Exhibition of 1819, as member of the jury, Breguet presented a retrospective of his clockmaking career, during which he had raised this precision craft to a degree of unprecedented excellence. The reliability and streamlined designs of his timepieces were far ahead of his era and already belonged to modernity. This tradition lives on at Breguet today in innovative timepieces, thus confirming their precursory status that bears witness to European culture and history. Opening times : daily except Tuesdays, 9am-6pm. Late-night opening until 10 pm on Wednesdays and Fridays. Admission : access to the exhibition is included in the admission to the permanent collections of the museum: €9; €6 after 6pm on Wednesdays and Fridays. Free admission for under-26s from the European Union, under-18s, the unemployed, card-holders (Louvre jeunes, Louvre professionnels, Louvre enseignants and Louvre étudiants partenaires) and Friends of the Louvre. Free admission for everybody on the first Sunday of the month.